There are probably several hundred restaurants woven into back alleys, pouring out from driveways, and lining the main thoroughfares in Siem Reap, Cambodia. Some no more than a rusting push cart; others, proud, smooth buildings bursting with glitz and glamour … All of them vying for your tourists’ dollar. “Where to Eat?” becomes a dizzying decision in an already potentially overstimulating environment. 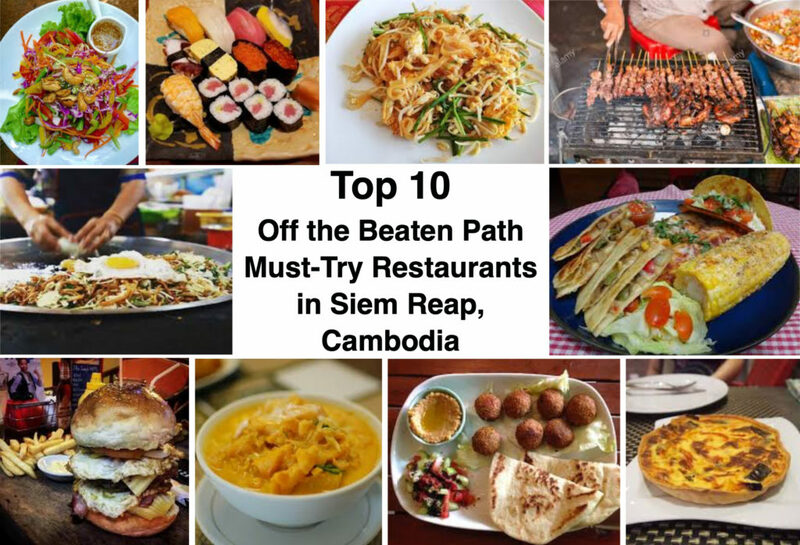 You could spend years attempting to sample every dining option in Siem Reap, but (truthfully) even locals get lulled into a routine of familiarity and fail to tap into the exciting and ever-changing canvas of food options merely a short scooter ride away. The unsuspecting traveler’s foodie experience is further stymied by the neon canopy of common franchises, tour provided buffets, and endless sea of identical, red, beer-touting restaurant placards. So, for all of those times you really just have a craving for a particular spice, need a new budget-friendly Khmer go-to spot, would kill for good pasta, or must satisfy your hunger for quiche before you crack, here are our top ten picks to start the new year (based on overall value, quality, and variety). The moment we walked up to Mo’s I knew we’d hit something special. Friendly strangers graciously shared their table with us for a while (as the restaurant was already filled to the seams with lively chatter). Whether you choose Western tables and chairs over ground mats and cushions you are served a feast fit for a king. I was pleased by the wide variety of Middle-Eastern and Mediterranean dishes, fair prices and sharable dish sizes. We all left full and happy after capping the meal with a variety of spectacularly decadent desserts and herbal tea. At some time during your visit take a moment to chat with the owner, ‘Mo’. He is a colorful gentleman with an easy smile and quick laugh; you will quickly learn why this is already a happening place to be. As I write this, Atmosphere is celebrating its grand re-opening in a larger location. Great job guys! You are just a stone’s throw from famed ‘Pub Street’ when you belly-up to the well-stocked, mirrored ebony bar and burgundy walls of Belmiro’s. The pub’s great location as an exterior corner with patio perimeter is trimmed in hanging flags from the world over giving it a welcoming glow. But … if you are craving a little bit of a States-style urban pub feel, this is your place. The portions aren’t stingy, and daily drink specials are easy on the pocketbook. Boston-style pizzas are Belmiro’s specialty, although I do find myself craving their cheesy, meatball sub-sandwich regularly. Stuffed crust and deep-dish pizzas (for the carb-craver in the group) aren’t the only indulgent options. Weekly rotating chicken wing flavors on ‘Wing Wednesdays’ is always a family favorite. If you are a true Ranch dressing-loving American, get excited … This is one of a very select group of eateries in the entire city which carry the staple dipping sauce at all! The ‘South End’ of Siem Reap is a fabulous business collective of Khmer and foreign trailblazers looking to foster the growth of this budding artisan community, empower the local workforce, and grow art appreciation in this already culturally rich hive. Needless to say, we are smitten with the vibe of the South End and are eager to unearth all of the lovely foodie gems within. Fortunately, we happened upon Chanty early in our search (and quite by mistake). We went looking for Khmer fusion and found the best value for chicken and beef kebob BBQ we know of in town. Shoulder to shoulder with its neighbor, this bare bones shop isn’t fussy and gets right down to the job of making outstanding food at a price even backpackers can afford. Chanty offers more than generous serving sizes (we ate so much we had to take home half of our order) and the staff is super friendly. Grab a plastic chair and belly up to the folding table, Chanty’s got the grill fired up and aims to please. Curry Walla owns two comparable restaurants on opposite ends of Sivutha Blvd. Being that Sivutha is like the spine of the most heavily traveled network of roads in the entire Siem Reap downtown area it could be easy to pass right by either storefront without a second glance. These no-frills dining halls aren’t heavy on ambiance, but don’t let their uninspired facade lead you astray. What Namaskar and Khmer Chef lack in tactile luster they make up for several times over in a savory curry flavor palate, the rich aroma of stewed Indian meats, and beautiful vegetarian dishes that restore my faith in humanity. We never choose individual dishes at this feast; If ‘sharing is caring’, then this is the meal of my family’s love language. A treat of a meal ,well-worth the incremental increase in cost per person. We happened upon this tucked away gem on a quest for the camaraderie and mental stimulation of a good pub quiz. What we ended up with, was a fabulous all-ages evening out and a new favorite haunt. The ice-cream drenched, chocolate banana bread made everyone sit up and take notice right off. Upon further exploration of Ivy’s culinary vision we discovered many engaging flavor pairings not often seen in a town full of repetitive menus: a delightful Italian chicken cheesesteak sandwich, rich, spinach and feta ravioli in a complimentary al fresco sauce, and an extraordinary homemade chocolate mousse … to name a few. Imagine an Italian inspired kitchen hidden in the heart of a palm-thatched, traditional wooden Khmer village home, and dress the whole thing up as a Western-minded ‘chill pad’ (complete with free billiards and Cambodian memorabilia wall). If you get comfortable enough you can always get a room in the attached guesthouse and enjoy the Ivy’s cooking all day long. Clayton and his happy little crew work hard to make sure you enjoy your experience at JB. From the pool table to the funky bike yard art, the vibe here is laid-back and playful. Cool beats play while the bar does it’s job putting on a sports-pub fare feast. Spot-on, gooey homemade mac & cheese are a strong stand-alone meal or a great side to share. Jungle Burger is unrivaled in my opinion for their burger and sandwich menu; no bad options here. The crown jewel of which is the ‘Burg Khalif burger’, easily a full meal for two people. You will find a surprisingly well-rounded salad selection, and all-around ample portion sizes for sharing. If you want to add a little (or a lot, if you ask nice) spice to your meal, order up a signature chili & mango margarita … it burns so good! We have been eating at the Mom New River location in the alley at one end of Pub Street for five years now. Psa Chas is located in the heart of Pub Street’s Night Market area. Depending on your whereabouts, you can easily navigate to either wonderful location. We come back week after week, year after year, because the value and consistent quality these family-owned businesses offers just cannot be denied. Both are modest and traditional Khmer restaurant on our list, and why not? After all, they represents a remarkable culture offering a myriad of signature dishes and almost as many family-specific tweaks to each one. Like the generational patterns woven into the precious, golden Khmer silk, recipes like: amok, lok-lak, prahok, and num ngov soup all have been honed to unique perfection by their Cambodian chefs. Laughably, Mom New River’s weighty menu resembles a homemade telephone directory riddled with inconsistent pagination and rife with fun English spelling errors, but the up-side is that you are bound to find something for everyone’s taste at a really great price. Again, you may be tempted to pass by in search of a more striking or familiar setting, but don’t. Pull out a seat, order any kind of lovely fresh fruit shake you can imagine, and just know that whatever you order will be made with pride, taste great, and give you a glimpse into the wonderful flavors Khmer food brings to the table. All the refined sweetness and splendid pomp of a fine Parisian bakery … a continent away from France. Plump breads and crunchy baguettes baked daily lure you into the boulangerie via a seductive olfactory trance. Delicate pastries and tarts crowned in sugary filagree dazzle the eyes like proudly displayed fine jewels. The unexpectedly keen selection of European deli meats compliments the bread offerings nicely, and a pleasant coffee/tea offering rounds out this quality experience. Don’t forget the quiche, glorious quiche! Admittedly, my unprecedented favorite guilty pleasures are their almond paste filled croissants. Ah, bliss! Not an everyday budge-friendly option, but a magnificent treat without breaking the bank. The bustling ‘street corner bistro’ vibe in a pedestrian-friendly metro area also lends itself nicely to a quick stop-in for take-away dining. A surprising number of vegan and vegetarian restaurants are popping up all over town, but this one effortlessly spans the gap from crepes to paninis. In between, it hits the mark on a wide array of lovely, body-nourishing, taste bud-tickling fresh juice concoctions. You are drawn into the spacious garden and the easy rattan lounge dining room for a respite from the surrounding city activity. Thankfully, these grounds are spared the worst of the periodically excessive Siem Reap heat. Sit a spell, catch up with yourself (or a friend) over a large pot of herbal tea; take a yoga class; peruse the artsy/craftsy trinkets made by local artisans for sale in Peace Cafe’s gift shop … it’s all good! Focused on civic and spiritual enrichment, Peace Cafe partners with several NGO’s to empower local Khmer people through education, vocational training, and employment. The fare doesn’t lend itself to over-indulgence by nature, but you will leave satisfied and feeling nourished. Seen as how Siem Reap is nowhere near an ocean, I had been remiss to try sushi in my adopted town. However, on the occasion we get to put on our fancy Chacos and dine in style celebrating of a good friend, I must face my doubts about the quality of sushi available this far inland. I am here to say, happily, that Safari Sushi hit on all the marks: value, presentation, ambiance, quality, and service. The lush entrance draws you into a private garden oasis. Guests are greeted by the koi pond’s tranquil gurgling and encouraged to lounge on the patio before dining. Once inside the restaurant, the finishes are tasteful and guests are not crowded together. The space allows you to linger comfortably in conversation and the staff is helpful without hovering. We ordered an assortment of nigiri, sashimi, and even an impressive sampler roll to share around the table … no one left hungry. The fish was firm and fresh and the selection fair. Our little party enjoyed a decadent meal of sushi and sake (topped of with hot jasmine tea) at a fraction of the cost of the more flashy sushi restaurants in Siem Reap. Um, yes please! I know I will be voting for sushi on my next ‘date night’. FYI, the restaurants listed here are in alphabetical order for the sake of satisfying my left-brain tendencies, by no means is the order in which they appear a ranking. Each place is uniquely wonderful, and there are, inevitably, countless similarly worthy eateries in Siem Reap … we just haven’t found them yet. If you have a favorite spot to grab a bite in Angkor-town, let us know! We are always up for a new foodie adventure and welcome your comments.